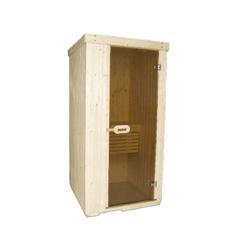 Thid is a pre-fabricated Sauna Cabin made of quality Douglas pine wood. Made exclusively by Sanjivani for use in high temperature, the Cabin sports a cosy ambience with a very polished look. It helps to cure Detoxify the whole body and also cure the Kidney stone, Skin problems, Weight reduction & Improves the blood circulation etc.. The Inflatable Steam Sauna Spa requires no installation, no plumbing and no specialized electrical connections. 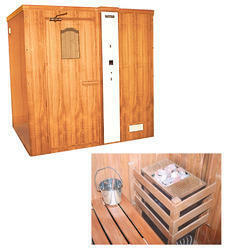 Complete sauna bath system with 6.0 K.w sauna heater. 48"x48"X76" Standard Sauna Room with 3 KW Heaters. Sauna Rooms can also be manufactured as per order depending upon the space available and the persons user. We offer high quality Spa Equipment.